The books are spiral-bound vertical format workbooks. Each one features a few instructors and has 48 pages. For a book this thin, it's not meant to be comprehensive. This particular book that covers Anatomy features instructors Wylie Beckert, John Staub, Marta Nael and Richard Anderson. They are all accomplished artists and you can tell from their art in this book and the portfolio on their websites. The first chapter by Wylie Beckert looks at three fantasy characters focusing on only the head designs. You can guess easily the rest of the subjects from the chapters' titles. Basically, you look at the illustrated examples and then copy what you see with the help of instructions and drawing tips. The drawing templates are actually just faint outlines of the illustrated examples. You'll be told to draw in the facial features, expressions or accessories, and sometimes to practice shading and lighting, or just to practice getting the right form for the head. If you run out of templates or space on the book to draw, you can download additional templates to print out at 3DTotal Publishing's website. It's a fun hands-on book on learning. 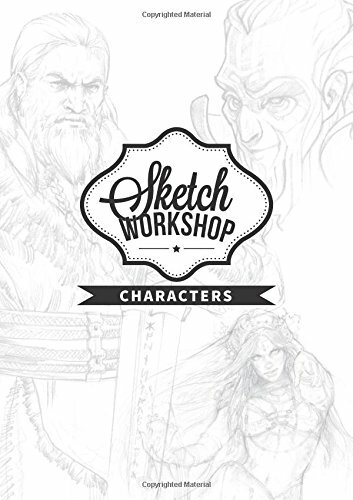 The book's not too expensive and so it's a nice starting point to learning how to draw some fantasy characters.